The report, entitled 'Earnings, jobs and innovation: the role of recycling in a green economy' shows that recycling has numerous environmental benefits including diverting waste away from landfill, thereby avoiding pollutant emissions. It also helps meet the material demands of economic production, preventing the environmental impacts associated with extracting and refining virgin materials. Revenues from recycling are substantial and growing fast. From 2004 to 2008 the turnover of seven main categories of recyclables almost doubled to more than €60 billion in the EU. Due to a reduced demand for raw materials and a decline in commodity prices during the economic downturn the turnover of recycling declined sharply at the end of 2008 and in the first half of 2009 but seems to have recovered somewhat since then. The growth of recycling is being driven by increasing demand for recyclables, as booming Asian economies help to push up the price of materials. Another driver has been EU waste directives, which have contributed by creating obligations to recycle or recover increasing percentages of waste, and discouraging landfilling. As a consequence, the amount of recyclables sorted and placed on the market has increased 15 % between 2004 and 2009. More jobs at higher income levels are created by recycling than compared to landfilling or incinerating waste. Overall employment related to the recycling of materials in European countries increased by 45 % between 2000 and 2007. Recycling can meet a large proportion of the economy’s resources demand, alleviating pressure on ecosystems to provide resources and assimilate waste. Recycling already meets substantial proportions of demand for some resource groups, notably paper and cardboard, and iron and steel. However, even maximum recycling cannot cover all EU demand for resources. Increased recycling can improve 'resource security', but economic growth driven by ever increasing material consumption cannot be sustained, as it requires an infinite volume of resources. Recycling is particularly valuable in securing supplies of critical resources. Recycling of rare metals is essential for the EU to pioneer new technologies, particularly in areas such as e-mobility, information and communication technologies and renewable energy. 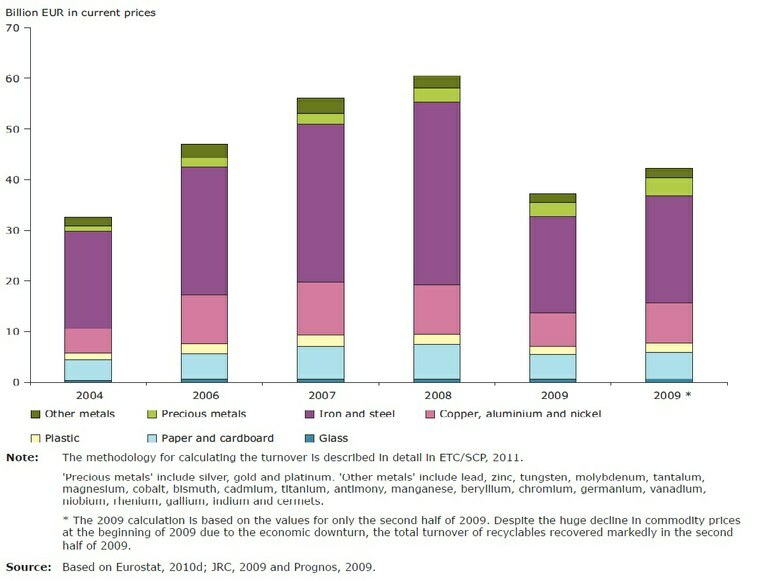 Imports of precious metal waste into Europe increased 50 % between 2000 and 2009 – the only group of recyclable materials which grew significantly during this period. However, rare and precious metals are characterised by dissipative use, meaning that they are used in small amounts in a multitude of applications and products. The existing recycling infrastructure has not yet focused on this problem, meaning that many of these metals are lost. The economic, social and environmental benefits of recycling highlight the need to shift to a green economy in order to generate prosperity while maintaining a healthy environment and social equity for current and future generations. For references, please go to https://www.eea.europa.eu/highlights/recycling-industry-can-boost-the or scan the QR code.